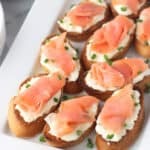 Burrata and smoked salmon crostini is a simple but flavor packed appetizer ready for entertaining! A nice glass of wine pairs perfectly with the crostini for an effortless food and drink pairing. Place an oven rack in the top section of your oven, leaving about 4-5" of room between the top where the broiler is and the rack. Set oven to broil. My oven gives me the option of setting a broil temperature, so I set it at 500°F. Let oven heat for a few minutes. While oven is heating, line a baking sheet with foil. Slice half of a baguette loaf into 1/2" thick slices on the diagonal, and place in a single layer on the baking sheet with a little space between them. Brush the tops of the baguette slices with olive oil. Place baking sheet in the oven on the top rack. Watch closely as bread toasts, as this will only take 2-3 minutes. Remove baguette slices from the oven when the top edges have browned and are crisp, but the centers are still golden and a bit soft to the touch. Top each slice with a spread of burrata, about half of a slice of smoked salmon, and a sprinkling of fresh chives. Serve and enjoy! Broiling the baguette slices instead of baking them crisps just the edges and prevents the centers from becoming too crisp (and tearing up the roof of your mouth). Brushing with olive oil also helps keep the centers slightly springy. Keep a very close eye as the baguette slices are in the oven because they can go from perfectly done to burnt very quickly. This recipe is very scalable! Increase the quantity of ingredients to prep for your size crowd.